The Chaparral 183 SS Bowrider is the perfect size boat for a day of fun on the water. Economical 4 cylinder 3.0 L Mercruiser I/O with only 160 hours. Garaged its entire life, it has not seen salt water in past 6 years. 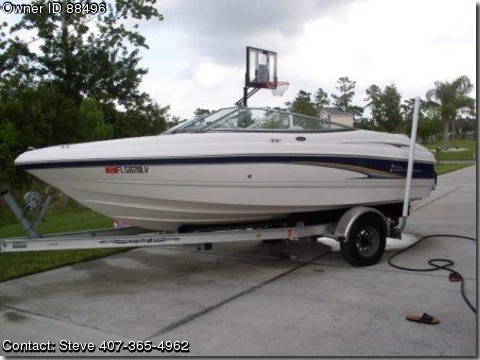 This boat is large enough for family or friends who enjoy skiing, tubing or just boating around. The classic features and styling will speak for themselves. From the cockpit and transom seating to the cushioned bow seating, there is ample room for those sun lovers. For those who like to stay in the shade, the optional bimini cover is a god-send. Non-skid fiberglass floor (no carpet) makes cleanup a cinch. A walk-through windshield allows access to the bow area with additional storage under the seats. Magic Tilt Signature Series Trailer with new hubs. Fantastic boat at a fantastic price.